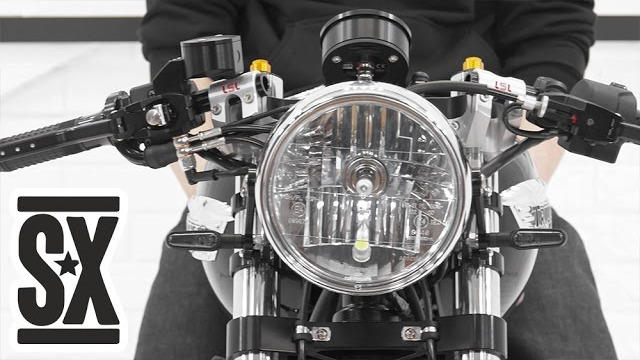 Optics and lighting devices for cafe racers should be light, compact, fitting into the style of the project and with factory functionality, if the motorcycle is being built to ride around the city. We plan to actively ride the motorcycle, so we paid special attention to the quality, ergonomics and location of all the elements. Replacing the fork required a complete change of all the attachments with adjacent elements on the steering. The rear wing did not fit in style, so we also removed it. A large Russian plate number creates an additional problem, because it must be properly attached and not overload the tail design. Below you'll find more information about choosing and installing each item. In the drain on the left headlight mount, there's a ignition lock which is located very inconveniently, so we moved it to the frame (see the article: http://stuntexclub.ru/news/zamok-zazhiganiya-i-rele-zaryadki-triumph-cafe-racer). Instead of the standard headlamp, we chose the headlight LSL Clubman. At first glance, it is the same as the standard one, but the LSL Clubman is much lighter (aluminum body and plastic lens) and slightly smaller in size, which is why it looks better on the cafe racer. For its attachment, we used LSL lightweight aluminum holders with holes for turn signals. Installing these holders creates one problem: they are adjacent to the mounting seat of the headlight at an angle, so you need to put washers or grind out a special sleeve (looks better), which we did. We chose D-light turn signals with a bright diode in an aluminum case and a rubber damper, which dampens vibrations. Guards from the turn signals can be hidden in the headlamp. Connectors have to be assembled from scratch. Turn signals rubber dampers on the Triumph Bonneville are just counter-insurance, because the bike is made with high quality and there is no vibration on the steering system. The main problem of the tail is the mount of a large Russian plate number. We decided to use it as a wing and fixed it on an ABM frame. The ABM frame is a great solution because it can be placed on the turn signals and stop signal with integrated license plate lights - this solves all problems. LED optics in aluminum cases are compact and look good. To mount the ABM frame, we had to adapt the mount from the LSL kit for the Triumph Bonneville. When building a cafe racer, we wanted to make it a better version of the factory one, but with factory functionality, in order to ride in the city without any problems. The new optics is much lighter and more compact than the factory one, while complying with safety standards!